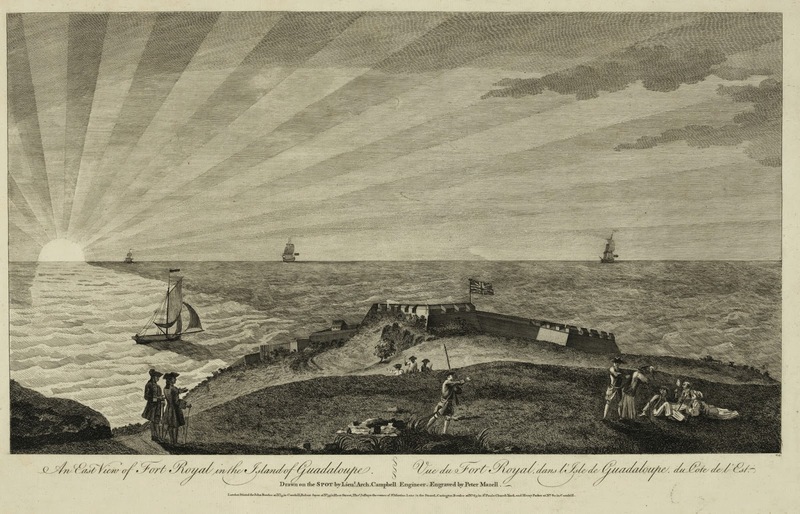 An east view of Fort Royal in the Island of Guadaloupe, Lieutenant Archibald Campell, engraved by Peter Mazel, 1768, Library of Congress. Lieutenant Campbell composed more than one image of Fort Royal during the occupation of Guadaloupe by the British during the Seven Years War. I've featured his North view of the fort in a previous post. Guadaloupe was one of the Caribbean islands that the British seized from the French during the war, and was returned to them with the Treaty of Paris in 1763. Just as in Campbell's North view, the East view shows sailors cavorting with soldiers. This time, it isn't a tarpawlin and a lobsterback shaking hands, but a small mess of drinking, smoking, chatting sailors being warned by one sentry of another's approach. Don't forget, you can click on images to enlarge them! With a slight smile, our sentry taps this Jack on his back. The sailor in the detail above wears wide legged trousers or slops/petticoat trousers that run all the way to the top of his ankles. Atop his head is an interesting hat. It looks, at first glance, to be a cocked hat, point forward, with the rear brim let down to cover his neck. This makes perfect sense in a tropical climate, but is also the first time I've ever seen this on a primary source image of sailors. Then again, it might be a round hat with just one brim turned up by the wind. Given the lack of movement on any other fabric, and the slowly rising smoke from the pipes, I'm inclined toward my earlier opinion. What do you think? In any case, Jack also leans on a walking stick, and wears a double vented jacket with no collar that ends about the top of the thigh. Sprawled across the ground in relaxation, three sailors enjoy the setting sun, tobacco, and a bottle. 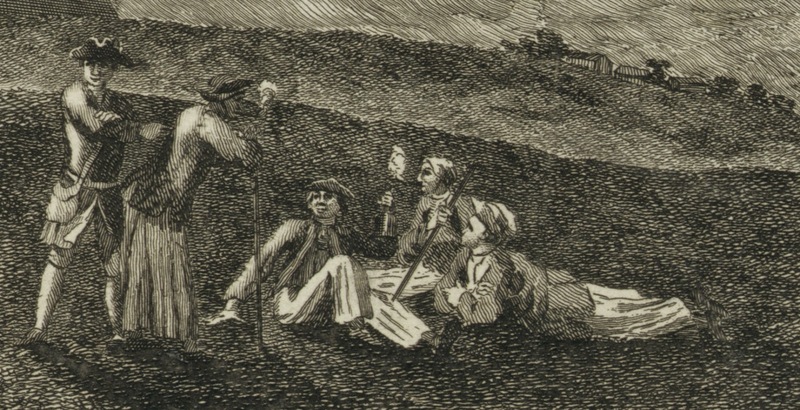 The sailor on the far left, holding the mallet bottle, wears a cocked hat with the point reversed, a jacket with no collar or cuffs, and no waistcoat. A neatly tied neckcloth hangs down over his plain shirt. Wide legged trousers run down to his ankles, where he wears pointed toe shoes. Our other two tars look beyond their mate toward the horizon. Each of them wears the same slop clothes as their mate, save their headwear. The chap in the background wears a workcap or knit cap, but the tar on the right is a bit harder to nail down. It could be that he's wearing a jockey style cap, but I cannot be sure.